The 3-story Tomb of Khali Dinh is carved into a hillside 6 miles from Hue and is one of 7 historic tombs open to visitors in this area. 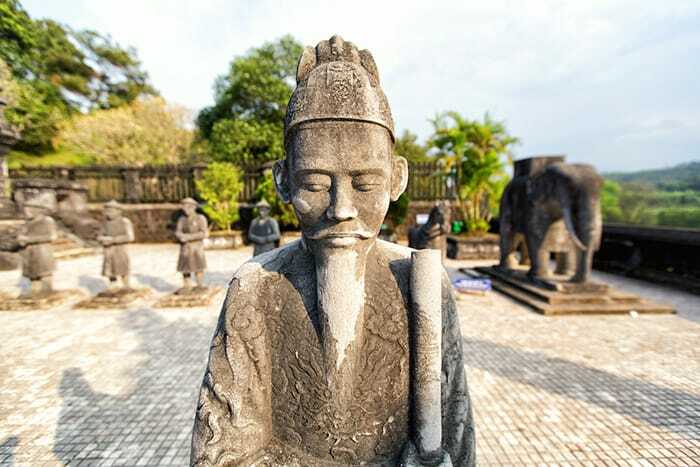 In the culturally rich city of Hue, Vietnam, you can explore many UNESCO World Heritage Sites, including The Forbidden City, 7 Royal Tombs, and many pagodas. Affordable hotels and savory cuisine beckon visitors year round. Countryside bike tours and river boat tours are also enjoyable ways to explore this scenic area. Hotels are located in the South of the city, while most of the attractions (including the famous Citadel) are in the North. With attractive prices ($40 US or less per night for most hotels), it’s easy to see why Hue continues to attract its share of visitors. Entrance to Hue citadel and Forbidden City in Hue, Vietnam. 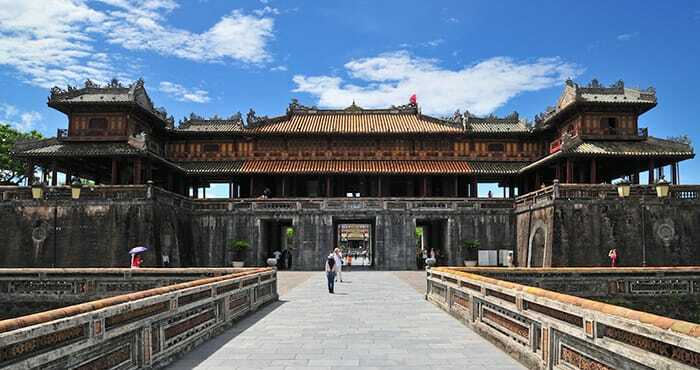 The elaborate fortress in the heart of Hue was once the Imperial City of Vietnam, where the ruling emperor, his court, and government officials lived and worked. The citadel includes several palaces, pavilions, a temple, the Royal Theater. In the center lies the Forbidden City (also called Dai Noi), the personal living quarters for the emperor, where only the emperor, his family, concubines, and servants were allowed. Today, one of the palaces has been converted into the Museum of Royal Fine Arts, in the grand 19th century Long An Palace. You can see several exhibits from the Nguyen Dynasty here. Visitors into the Citadel and interior palaces and other buildings are allowed daily. 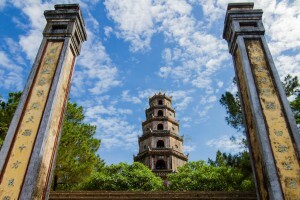 Octagonal towers of Thien Mu Pagoda, built in 1601. If you have limited time in Hue, stop by the 17th century Tu Dam Pagoda, which is conveniently located within a few km of the Citadel. However, the most iconic and picturesque pagodas of Hue are a few kilometers southwest of the city. The 7-tiered Thien Mu Pagoda is the tallest and the oldest pagodas in the area and is a UNESCO World Heritage Site. Tu Hieu Pagoda is small and stately, with a lotus pond in front and is near Tu Duc’s Tomb, and is the iconic pagoda that Hue is known for. Bundles of incense on display in Dong Ba Market. This is the city’s biggest marketplace where you can buy anything you’d like, from electronics to incense to housewares to clothing and accessories. The lacquer ware here is particularly fine, as is the silver jewelry. Tu Duc Tomb is one of 7 royal tombs of the Nguyen Emperors you can see just outside of Hue, Vietnam. Just 6 km (4 mi) outside the city of Hue, the first of 7 royal tombs of Nguyen emperors can be found, the Royal Tomb of Tu Duc. 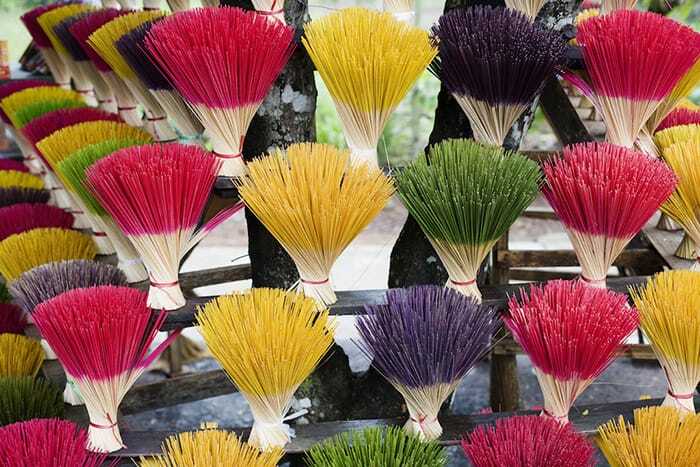 These UNESCO World Heritage Sites are nestled within the forests outside Hue. 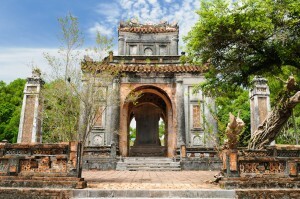 Some tombs are well preserved and others are in ruins, damaged during the Tet Offensive of the Vietnam/American War. Other notable tombs along this route include the Tomb of Thieu Tri, the Tomb of Khai Dinh, the Tomb of Dong Khanh, and the Tomb of Gia Long. You can take a boat tour along the Perfume River to see these tombs, rent a motorbike, or take a bus tour. Almost all tours will take you to the Royal Tomb of Tu Duc, which is one of the grandest and most impressive of all the tombs. 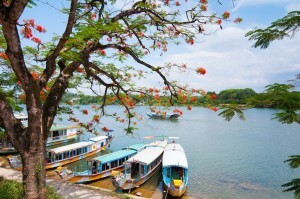 Scenic Boat cruises along the Perfume River can take you to the Royal Tombs and other sights. You can take a scenic Perfume River cruise in a dragon boat and explore several interesting sights in the area without fighting the infamous traffic of Hue. Some of the longer boat tours can take you to see Hon Chen Temple, Thien Mu Pagoda, and Minh Mang Tomb. Sunset cruises are available, which often include local folk music and dining. The former Imperial City of Hue offers visitors a historic and culturally rich place to explore. Located near the coast, it’s also within a short drive of Thuan An Beach, which is less than 15km from Hue. Thuan An Beach is a perfect getaway if you want a relaxing day in the sun and water. Before you embark on your trip to Vietnam, get your Visa papers in order the quick and easy way with Vietnam Visa. You can get a one-entry or multiple-entry visa within a few days, or arrange to pick it up at the airport when you arrive.